Gene Kelly, circa 1944. Photo by Clarence Sinclair Bull (1896-1979). 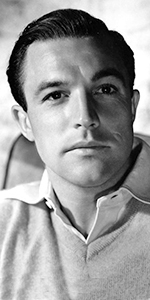 Gene Kelly was was a key figure in the musical films of the postwar era and into the 1960s. Kelly brought a powerful dancing ability, combined with a pleasent singing voice and charming sincerity to all of his film qork, making him popular with men as well as women. Born from Irish-German stock, Gene and his older brother James were enrolled in dance class when he was only eight. They both got beat up by the neighborhood bullies. Wanting to become a shortstop, Kelly developed into a tough kid. After graduating high school, Kelly attended Pennsylvania State College as a journalism major, but the Sto0ck Market Crash put an end to that. Quitting school, Gene and younger brother Fred danced in local nightclubs to help with the family budget. By 1931, Kelly was at the University of Pittsburgh, studying economics, and while there, became involved with their musical offerings, rising to become the director of the Cap and Gown Club. In the meantime, Kelly's parents opened a dance studio in Pittsburgh, with Gene being a primary teacher there. This kept on until Kelly departed for New York City, joping to become a choreographer, in 1937. New York wasn't buying, so Kelly returned to Pittsburgh, starring in shows at the Pittsburgh Playhouse. His director there was Robrt Alton, who brought Kelly to Broadway to be in Cole Porter's musical starring Mary Martin, Leave It To Me! for 291 perfs, from November, 1938, to July 15, 1939. 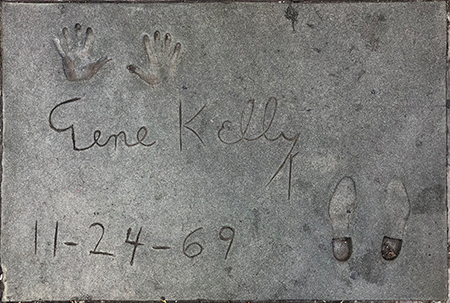 Kelly's breakthrough role was The Timne of Your Life, for 185 perfs, from October, 1939, to April, 1940, in which Kelly both danced and choreographed. He was asked to chroreograph Billy Rose's Diamond Horseshoe. Kelly got married to one of the gals in the cast, Betsy Blair, in October, 1941. Kelly got the lead in the Rogers and Hart musical Pal Joey, opposite Vivienne Segal, for 340 perfs, from December, 1940, to October, 1941. His perfectionist streak in his dancing made him an overnight star. Offers from Hollywood began to swirl about, but before leaving New York and Pal Joey, he choreographed one more show Best Foot Forward, opening in October, 1941. Producer David O. Selznick put Kelly under contract, selling half of it to M-G-M, where Kelly would work for the next decade. His first film, For Me and My Gal (which played the Chinese in November, 1942), with Judy Garland, was such a success, that M-G-M producer Arthur Freed bought the other half of Kelly's contract. After a couple of pre-booked loan-outs, Kelly was in Du Barry Was a Lady (which played the Chinese in July, 1943), with Red Skelton, and Thousands Cheer (which played the Chinese in December, 1943), with Katheryn Grayson. Kelly made a strong impression in Cover Girl (released in April, 1944), with Rita Hayworth, and really wow 'em with his dance number with animated characters Tom and Jerry in Anchors Aweigh (released in August, 1945), with Frank Sinatra. Kelly danced for the only time with Fred Astaire in a number from Ziegfeld Follies (released in April, 1945), with William Powell. Director Vincente Minnelli knew that Kelly was busting to make a more robust musical, and gave him the chance in The Pirate (released in June, 1948), with Judy Garland, but the lavish and imaginative film was "soft" at the box-office. To regain lost ground, he played D'Artagnan in The Three Musketeers (released in October, 1948), with Lana Turner, which is a love-it-or-hate-it movie. Kelly's next, Take Me Out to the Ball Game (released in April, 1949), with Frank Sinatra, was a success, with Kelly helping to shape the movie — wanting to direct. He got his chance with On the Town (released in December, 1949), with Frank Sinatra; Kelly co-directed the picture with Stanley Donen, which featured Kelly, Sinatra and Jules Munson dancing around New York locations. The film was a whopping hit. Kelly was now in the driver's seat. Always having been a Franchophile, Kelly and director Vincente Minnelli pulled together a musical from the George Gershwin songbook, and designed a lavish ballet to accompany Gershwin's tone poem, An American in Paris (released in November, 1951), with Leslie Caron. Not only was the film popular, it bagged the Oscar for Best Picture. Kelly and Donen had one more masterpeice up their sleeve, however. Singin' in the Rain (released in April, 1952), with Donald O'Connor and Debbie Reynolds, is a musical about the early days of the talkies in Hollywood, and is, even for people who dislike musicals, a thoroughgoing delightful entertainment. For all three of it's stars, the film containes their signature roles. Kelly and Minnelli weren't so lucky with their film of Brigadoon (released in September, 1954), with Van Johnson, but the film is well-liked by some, It's Always Fair Weather (released in September, 1955), with Dan Dailey, is a follow-up of sorts to On the Town. Kelly attempted a ballet film with Invitation to the Dance (released in May, 1956), with Tamara Toumanova, but the film crashed at the box-office. Les Girls (released in October, 1957), with Mitzi Gaynor, was his last musical for M-G-M. An era had come to a close. Turning to other projects, Kelly undertook a dramatic role in Marjorie Morningstar (released in April, 1958), with Natalie Wood, then returned to Broadway to direct the Rogers and Hammerstein musical Flower Drum Song; the wildly popular production starred Miyoshi Umeki and Keye Luke, and opened in December, 1958, running until May, 1960, for 600 perfs. With Flower up and running, Kelly played a cynical newspaper reporter in Inherit the Wind (which played the Chinese in November, 1960), with Spencer Tracy and Fredric March. Always a sucker for anything French, Kelly next directed a mute Jackie Gleason in Gigot (released in November, 1962), but it was cut by its studio and flopped anyway. Kelly did his first television show, taking on Bing Crosby's role in Going My Way for 30 episodes, airing over ABC from October, 1962, to April, 1963. Returning to the big screen, he played one of Shirley MacLaine's husbands inWhat a Way to Go! (released in May, 1964). Kelly as a solo director provided a solid hit for Walter Matthau, A Guide for the Married Man (released in May, 1967), directed the hugely-expensive film of Hello, Dolly! (which played the Chinese in December, 1969), starring Barbra Streisand, and directed The Cheyenne Social Club (released in June, 1970), starring James Stewart and Henry Fonda. Kelly accepted roles in various pictures, such as playing Liv Ullman's ex in 40 Carats (released in June, 1973), and appeared in the notorious bomb-turned-camp-classic Xanadu (released in August, 1980), with Olivia Newton-John. His final turn was in the Sins (aired over CBS, in February, 1986, with Joan Collins. In declining health, Kelly suffered a stroke in 1994 and in 1995. He died in his sleep at home in February, 1996 at the age of 83. Grauman's Chinese Theatre, Hollywood, California. 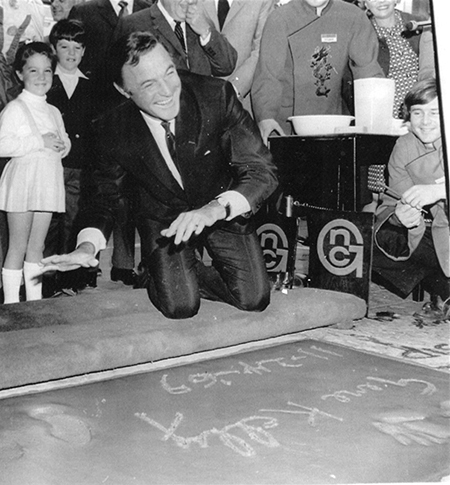 Gene Kelly Forecourt ceremony, Monday, November 24, 1969. Daughter Bridget and son Timothy stand by as Gene Kelly savors the moment.